I just bought my, new to me, Scot a few weeks ago too. Submitted by FS4161 on Mon, 06/20/2005 - 10:27. Submitted by Dave812 on Mon, 06/20/2005 - 11:16. You may have already read somewhere that these handles are designed to break before the halyard would break from over tensioning. If they broke when the sail was fully hoisted you may have been overtensioning. If it broke before that point (and you were head to wind) you are getting to much friction in the sail track or your halyard may be fouled. I would clean the track in the mast and spray some lubricant there and on the bolt rope of the main sail. Assuming this works you should leave about 2 inches of halyard showing above the head of the sail. In other words dont hoist it till it stops. I marked the halyard where it appears in the mast slot cut out so I can tell when I have the proper hoist and I dont hoist too far by accident. Then use the cunningham to get the proper luff tension for the wind conditions. Submitted by Transom on Tue, 06/21/2005 - 09:17. The Flying Scot site has rigging instructions which will answer a lot of the questions here (inlcuding raising the mast and how to attach the forestay). In particular, for raising the mainsail see http://www.flyingscot.com/rig9.html about 40% of the way down the page. You definitely should leave 2+ inches at the top of the mast for the mainsail, as pulling it all the way up may snap the halyard or break a handle. Submitted by Corsa on Tue, 06/21/2005 - 12:20. The sail was about 3/4 the way up and just got a little hard to raise. It seemed that the sail doesn't go high enough to take all the slack out of the sail at the bottom of the mast and front of the boom. The first handle broke when the sail was caught under the side cable (that would be my fault) Since I just have taken ownership, I have no idea if the handles have been 'stressed' previously or how old they are. I assume they get brittle with use and age. Cleaning the track sounds like a good idea. I also 'magicly' had the top sail batten dissappear. I am guessing it wasn't put all the way down into the pocket of the sail, or there is damage that made it slide out. I have repaired a number of spots on the sail. I am still a little unclear on the Boom Vang, I think I have one but not too sure where it fits or how it is used, or is it mostly for racing. I am learning and this forum is a great help. Thanks to all. P.S. The instructions on the Flying Scot website were a great help, I couldn't have figured it out otherwise. Submitted by Claus on Tue, 06/21/2005 - 13:12. [i]Originally posted by Corsa[/i] Since I just have taken ownership, I have no idea if the handles have been 'stressed' previously or how old they are. I assume they get brittle with use and age. I doubt the aluminum winch cranks get weak over age or usage. 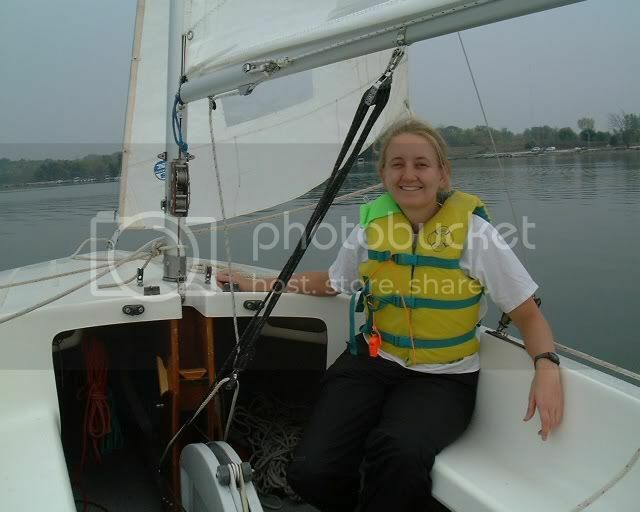 I also 'magicly' had the top sail batten dissappear. I am guessing it wasn't put all the way down into the pocket of the sail, or there is damage that made it slide out. I have repaired a number of spots on the sail. Most likely the batten pocket is damaged. We had that happen to our main sail. It's easely fixable with dacron tape or sail yarn and needle. I am still a little unclear on the Boom Vang, I think I have one but not too sure where it fits or how it is used, or is it mostly for racing. The boom vang is used when sailing upwind. I let someone else explain the proper boom vang adjustments since I myself still have to learn about it. The black line between the tabernacle and boom is the boom vang. As you can see it pulls the boom down. To make life easier it has a purchases and a cleat on the center board trunk (which you can't see on this picture). The vang can be used both upwind and down. Submitted by Tripp on Tue, 06/21/2005 - 16:08. Submitted by Corsa on Tue, 06/21/2005 - 22:07. Ah, The picture helps. That is the rope/pulley I have and wasn't sure about. I have a track on the boom at about that location. Just wasn't too sure what it was for.